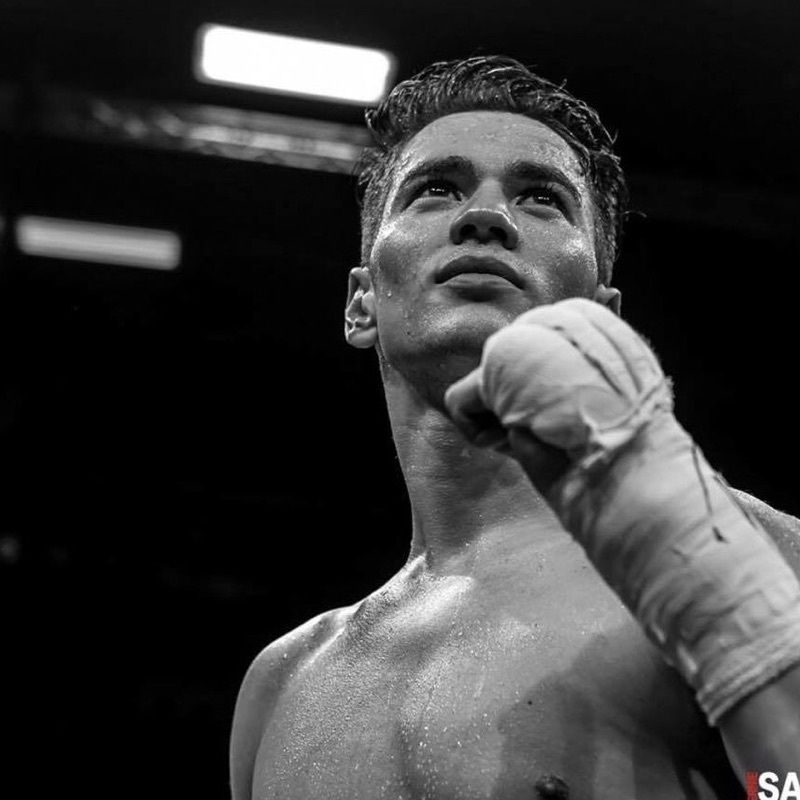 Giovanni Cabrera Mioletti is a rising star in the making in the world of professional boxing. In two years since turning professional, the super featherweight (130 lbs.) has put together a picture perfect record of 12 wins, with no losses and no draws. Not all that unusual in today’s fight game. But what is unusual is almost half of his wins, five (5) to be exact, have been against undefeated fighters! Compare that to Oscar De La Hoya who fought only one (1) undefeated fighter in his first twelve fights, while all-time greats Sugar Ray Leonard, and even “The Greatest” Muhammad Ali, didn’t fight any undefeated fighters in their first twelve professional bouts. Now I am not intimating that Mioletti is another De La Hoya, Leonard or Ali; at this stage, he’s another young boxer, paying his dues and just coming up. But he’s coming up hard and that’s refreshing to see! 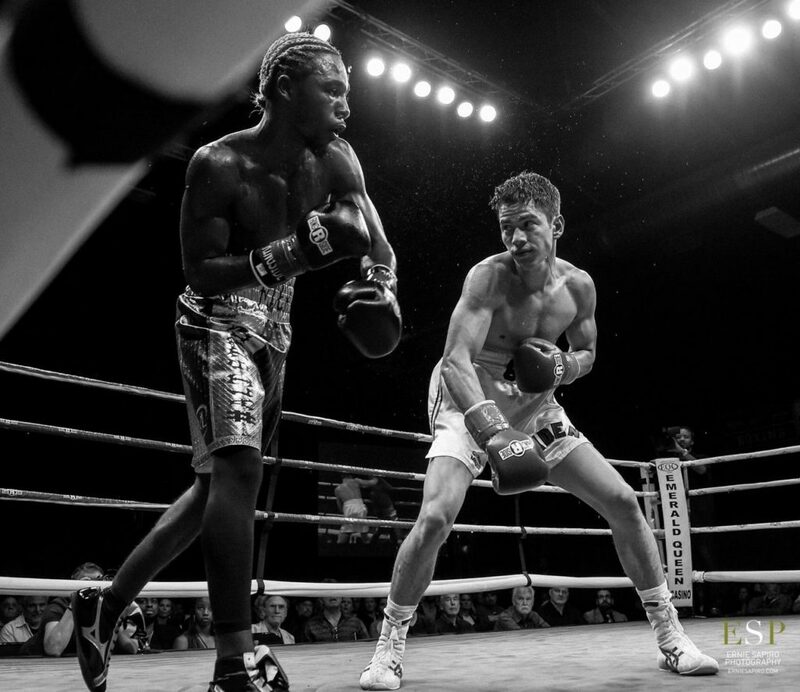 In his last fight, on June 9, 2018, he won a 10-round unanimous decision over undefeated Elijah Pierce who was 8–0 with seven of his eight wins by knockout! In the fight before that, Mioletti needed only two rounds to stop the undefeated Ray Lampkin, Jr. who was 11-0. SC: Tell us a little about yourself. GM: I was born in Seattle, Washington, July 19, 1994, but we moved to Chicago when I was about 8 years old. I grew up on the Southside of Chicago. But I also lived in Mexico. In the city of Leon, in the State of Guanajuato. SC: With that name Giovanni Cabrera Mioletti, are you Italiano or Latino? GM: My dad is Mexican, that’s the Cabrera part; and my mom is Italian, that’s the Mioletti part. I guess you can say I am half Aztec Warrior and half Roman Legionnaire. I was born to be a fighter. SC: So, do you speak Spanish? GM: Si claro! Absolutely I speak Spanish. I am as comfortable speaking Spanish as I am speaking English. SC: Are you married and do you have any kids? GM: No, no, that’s down the road. I am only 23 and right now I am married to boxing. I am 100% focused on winning a World Championship. SC: Tell us about your amateur boxing experience. GM: I had about 60 amateur fights. I only lost four or five, mostly at the Nationals. In 2013, I won the 132 pound Open Division of the Chicago Golden Gloves. I wanted to turn pro and decided to move to Los Angeles. I trained at the Wild Card Gym in Hollywood, and fought in the 2014 Southern California Golden Gloves. I made it to the semi-finals. Then I decided to go back to Mexico to get more experience. In 2014, I won the Leon City Championship. Then won the State of Guanajuato Championship. This qualified me to fight in the Mexican Regional Championships, which I also won, in 2015. This earned me a spot in the Mexican National Championships, in 2015, where I won a Bronze Medal. SC: So, when did you turn professional? GM: April 22, 2016, in Chicago. I knocked out my opponent in the 2nd round. SC: I noticed one thing when looking at your record. You live in Chicago, you call Chicago home, yet only four of your twelve fights have been in Illinois. Why have most of your fights been on the road? GM: You noticed that too! Well, that’s just the way it worked out. But I actually think it has made me a better fighter. 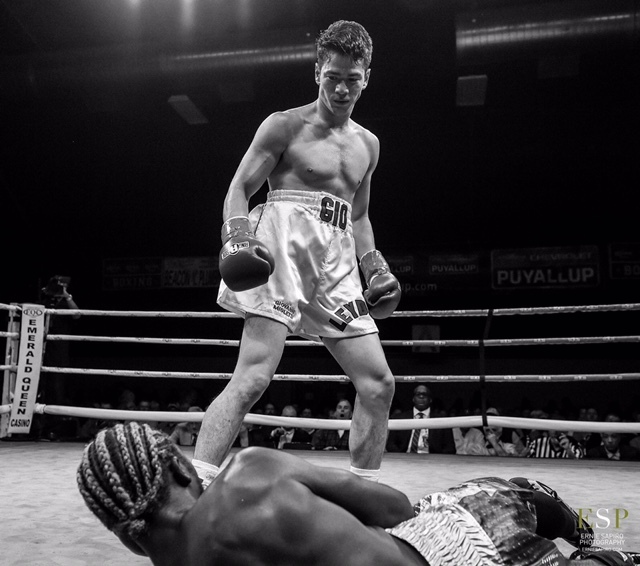 In addition to the four fights in Illinois, I’ve had six fights in Tacoma, Washington. I also fought in Corona, California, where I beat Roberto Meza who was 8-0, and I fought in Sloan, Iowa. In a way, it’s a shame; at one time Chicago was one of the world’s great fight towns. But that was a long time ago. Right now, there isn’t a lot of opportunity for me in Chicago and so I have to go where I can get fights. Maybe someday I can make that change. SC: You just won your 12th pro fight by beating another undefeated fighter. So, what’s next? GM: Whatever. Whomever. Wherever. Bring them on! I have only been a pro for 25 months, I am learning and getting better with every fight. I feel within the next year or so, I’ll be ready for a shot at a world title. SC: Anybody in particular you’d like to fight right now? GM: Yes. Ryan Garcia. We both turned pro about the same time. He is 15-0. I am 12-0. I think he is a good fighter. Make that a really good fighter. But I can beat him. And I love beating undefeated fighters! Other than some guy he beat in his pro debut (and that guy’s one and only pro fight was against Garcia) he has never fought an undefeated fighter. If he wants to see what he’s made of, let him get in the ring with me. SC: You seem pretty sure of yourself. Garcia is a dangerous puncher with twelve of his fifteen wins coming by knockout. And let’s be honest here, only three of your twelve wins have come within the distance. You don’t have a reputation as a KO Artist, so what makes you so sure you can beat him? GM: We don’t just think we can beat him, my team (John Nocita and Sammy DiTusa) and I know we can beat him. Because we know how to beat him. I’ve watched several videos of his fights. He is good and, you are right, he is dangerous, but he is not invincible. One thing for sure, if we do ever fight, it will be the fans who are the real winners. Garcia and I will just provide the fireworks. SC: And if you don’t get the chance to fight Garcia now, where do you go from here? GM: I’d like to win one of the regional titles and then get ranked in the top 10. I think that USBA Belt would look pretty good around my waist! Don’t you? Also, there is a new IBF Featherweight World Champion out there named Josh Warrington. He just beat Lee Selby and he has to defend his title against somebody; why not me? Warrington is 27-0 with six (6) wins by knockout. He’s proof you don’t have to be a KO Artist to be a World Champion! Give me another two or three more fights and I’ll be ready for him. He’s from England so I’ll fight him in London. I’ll fight him in his backyard. I’ll fight him in his living room. It doesn’t matter to me … just give me the shot. SC: The 12th and final question for the 12–0 fighter. For most of the people reading this, it’ll be the first time they have heard of you. Certainly, it will be the first chance they have had to get to know you. What do you have to say to all the fight fans who are reading this interview? GM: When I step into the ring I carry with me the tradition of my Mexican and Italian blood. I want to live up to the traditions of the great Mexican and Italian fighters who have come before me. I want to be the best, and to be the best I have to fight the best. That’s what I want. I promise all the fight fans out there I’ll always give them 100% in the ring. *** ABOUT THE AUTHOR: Steve Corbo, a veteran of more than 35 years in the boxing game, has been a professional boxing judge, as well as a co-host and color commentator for televised boxing events. He has worked with professional boxers in a variety of capacities, and has written several articles on boxing, which have been published in various periodicals. He has made his mark as a top boxing ring announcer, especially in Europe, where he announced major World Championship Title Bouts. Harold Lederman, Boxing Hall of Fame member and a part of HBO Boxing’s broadcast team, called Steve Corbo, “one of the best boxing ring announcers in the entire world.” A Chicago native, Steve has also been heard as the backup PA announcer for the Chicago Blackhawks NHL hockey team. He is a graduate of the University of Southern California. Great article on Giovanni Mioletti. I bet he and Garcia will be a great fight 1 day!